ECBC Sparrow Garment Bag Review + Giveaway! This competition has now ended! Congratulations to our winner, Kyli W.
Imagine you’re preparing for an upcoming business trip. The suggested clothes to pack include suits, button down shirts, and dress pants. In addition, you want to pack some running clothes to get in your morning workout in the hotel gym prior to your meetings. 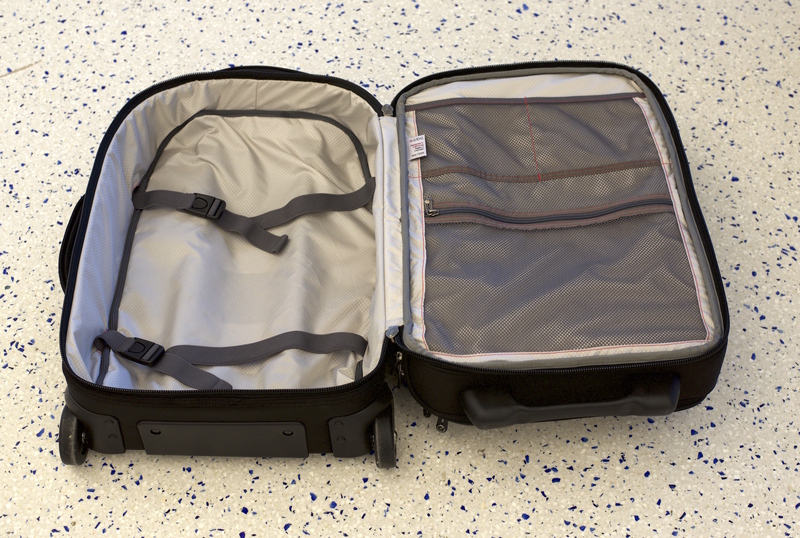 How do you pack everything in an organized, wrinkle-free way? A shrewd choice would be taking a garment bag. 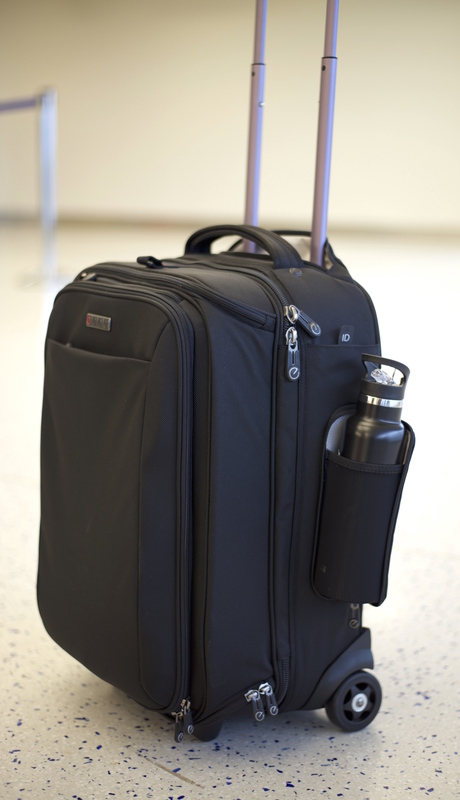 Garment bags are suitcases designed to be like wardrobes on wheels, holding your suits, shirts and pants wrinkle free. 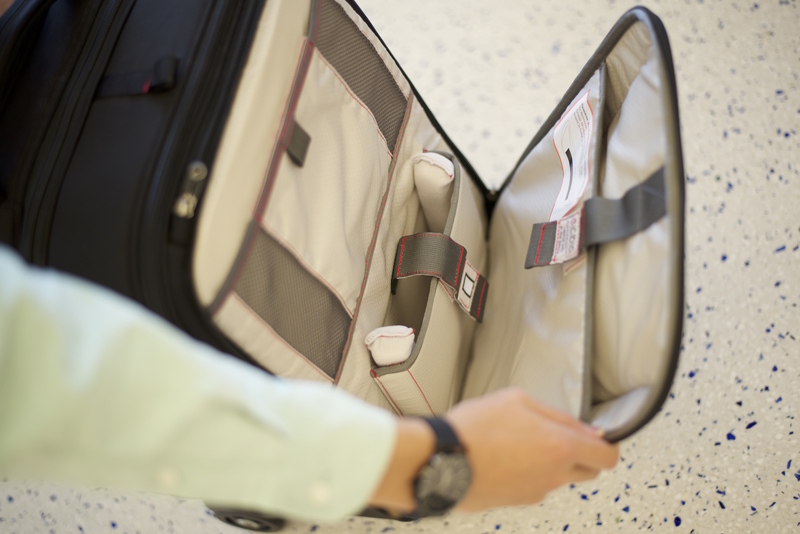 The Sparrow garment bag from ECBC can hold all of your suits and dress clothes while having a completely separate compartment for other clothes or gear and another compartment for your laptop and any important documents. Can it be used as a carry-on? 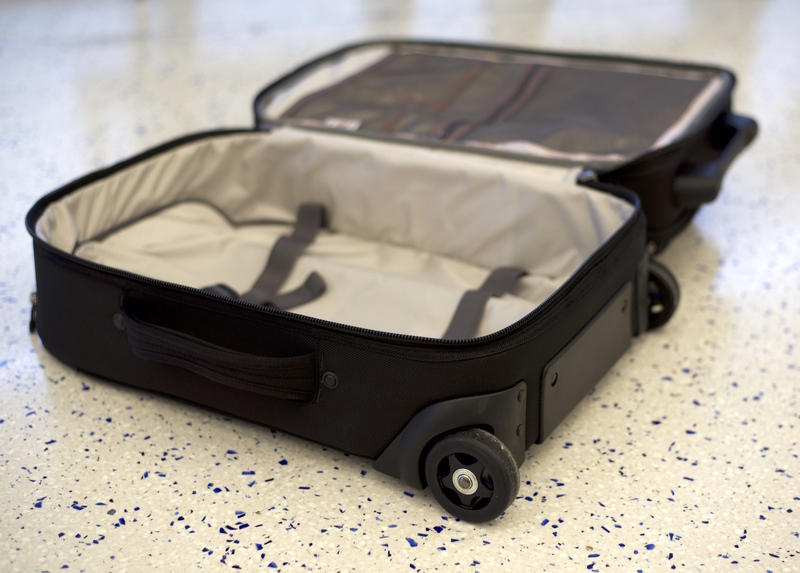 The Sparrow is within carry-on restrictions for most US airlines, although if you overpack it, it won’t fit. 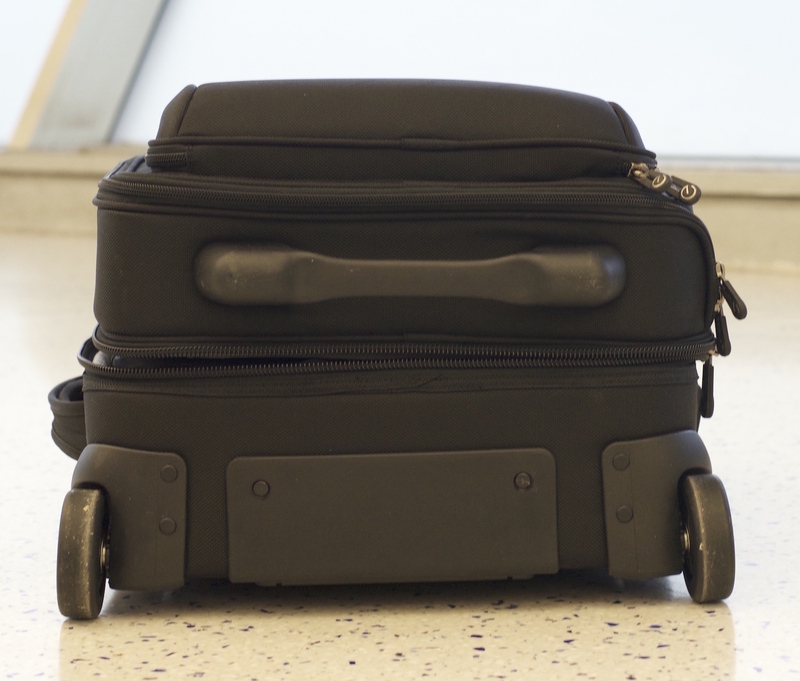 The depth of the bag is slightly too large – ideally the bag would be a bit smaller so travelers could comfortably take the ECBC Sparrow with them in the cabin. 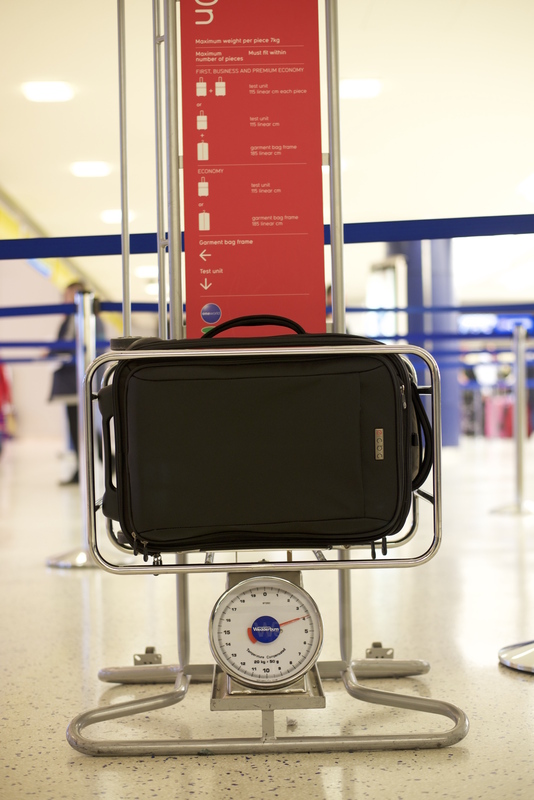 If you fill the laptop compartment to the max, it’ll be difficult to fit the bag into one of those carry-on boxes at the check-in counter. So in short, yes, the Sparrow can be used as a carry-on, but if you overpack and the bag is bulging, it won’t fit in one of those carry-on measuring box. The ECBC Sparrow is a two wheeled suitcase. It is not a spinner. The wheels run smoothly and are made of a hard plastic material. Bottom of the ECBC Sparrow. The bottom is reinforced. 3. 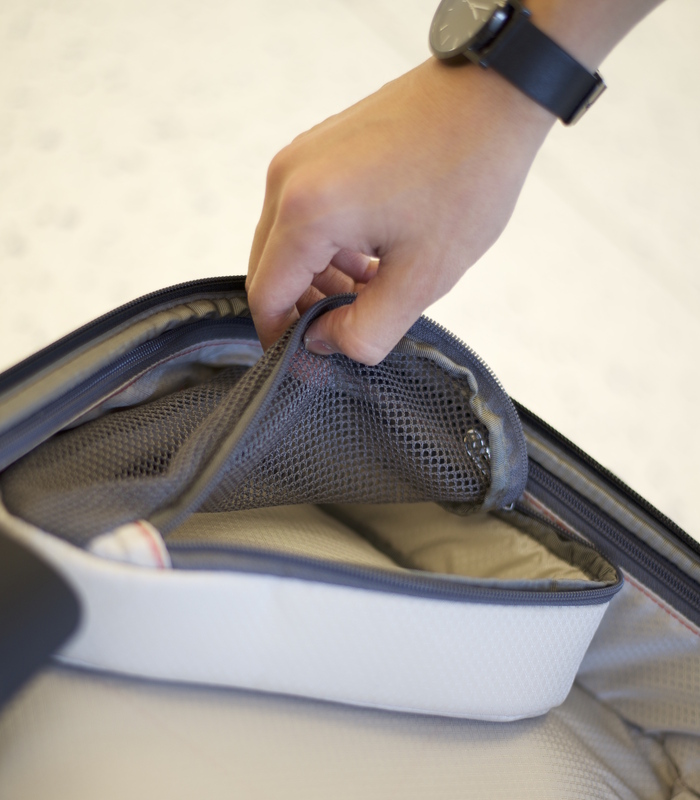 The main compartment – it has a standard rectangular design with two elastic straps for keeping everything in place. This compartment is about the same size as the garment compartment. I found the tablet compartment to be a bit unnecessary. Usually if you travel with a laptop, you wouldn’t need an iPad, so it wasn’t needed for there to be both a laptop and tablet compartment. Also, the tablet compartment is heavily padded – which is a good thing if you’re using it – but it takes up precious space. 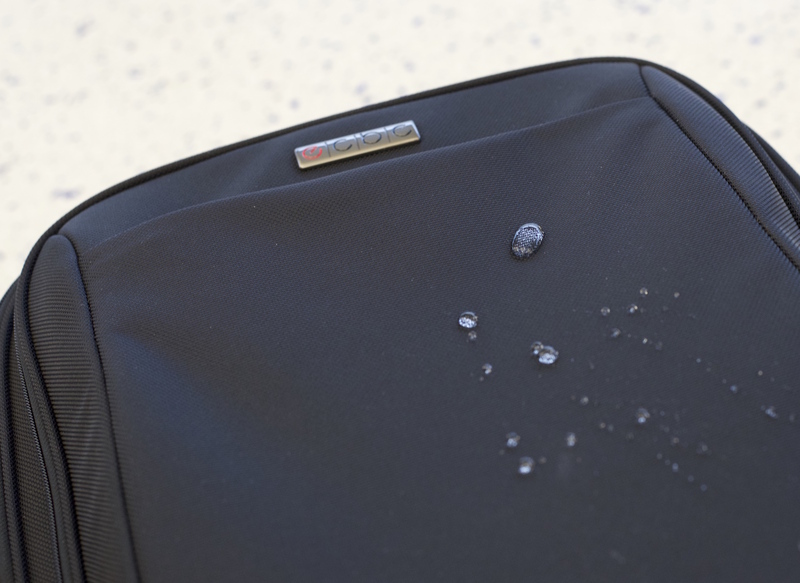 Having the laptop compartment on the very front of a soft-sided bag isn’t the most secure place. 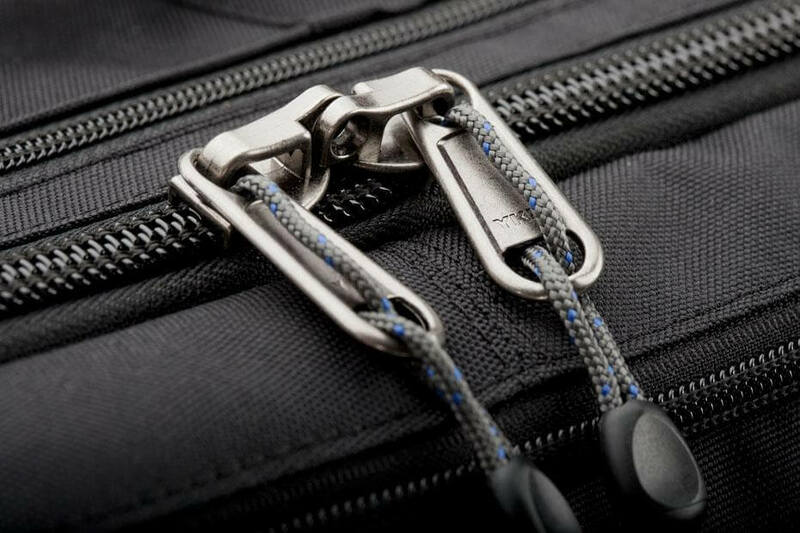 Or, even better than lockable zippers, ECBC should include a built in TSA approved lock, like the ones found on the Victorinox Spectra carry-on and the Hedgren Traction suitcase. The ECBC Sparrow garment bag is a winner in terms of organizing your clothes and gear, but it could use some improvement with it’s telescoping handle, zippers as well as it’s sizing. 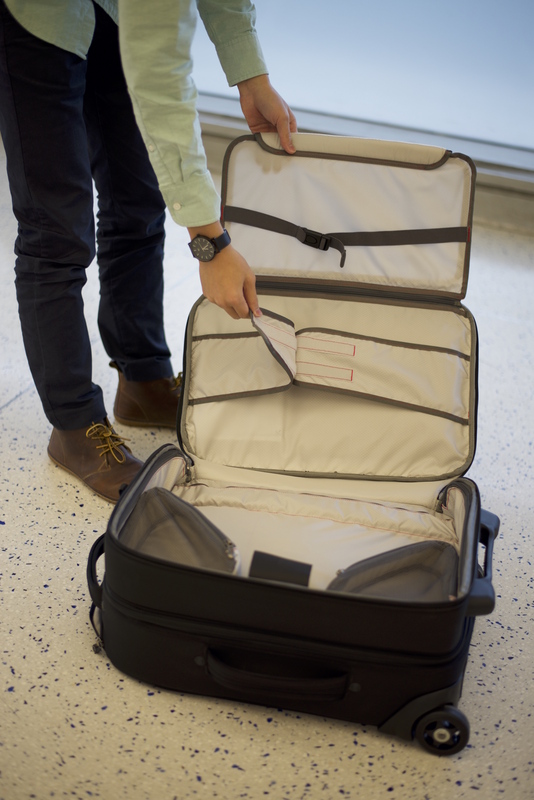 If you’re taking a trip that’ll require you to wear a suit in the near future, you’ll need a garment bag, and the ECBC Sparrow is a great option. 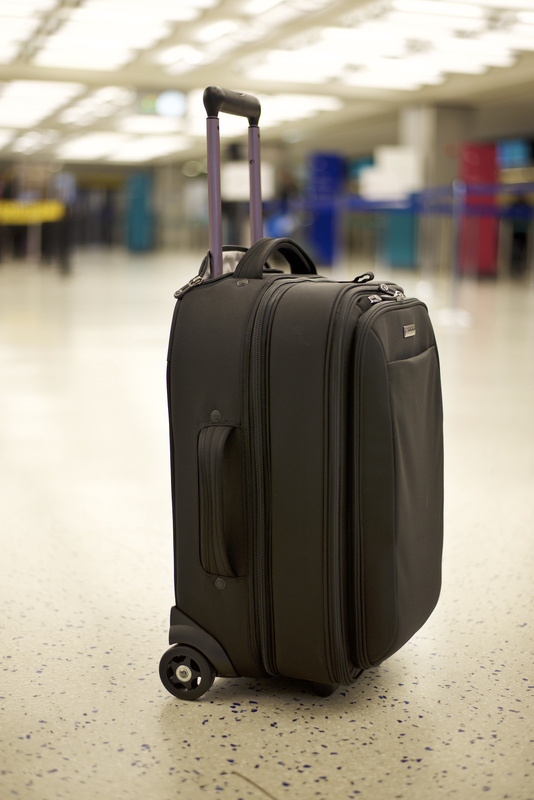 This luggage is priced at retail $399. The ECBC Sparrow Wheeled Garment Bag was provided for this review. As always, this ECBC Sparrow Wheeled Garment Bag review contains only my honest views and opinions. 🙂 Find out more about me and this site here. This would be perfect for my husband! He’s traveling to North Carolina in a few weeks! Very cool, is he going for a business trip? Good luck! LOL I live in NC!! We are traveling to DC, Emerald Isle and Florida this summer but I would love to use it to travel to Singapore with the family! I would take this on a weekend getaway with my boyfriend. Nice – when are you planning on going? clothes and I’ll arrive wrinkle -free. I’d like to take this with me to Ireland. Going on a cruise. This would be perfect. The next place I want to travel with the ECBC garment bag is Nova Scotia. Thanks for the chance. I would use it to go to Malta ! Nice – I haven’t been to Malta, but want to visit! I would be so happy to take this on my next family vacation; thank you so much. I would take this to see my best friend in Charlotte. Fabulous review on this luggage. My husband needs some so badly and I would LOVE to surprise him with this. He would first take it on a trip to the beach in Destin this summer but it would also be great for work travel. Thanks so much for the chance to win. I would like to travel to Iceland. Awesome! I was in Iceland about 2 years ago; it’s a super photogenic place! My nephew lives in Michigan- so I can totally see myself taking this beauty on a trip to visit him! Nice! What part of Texas are you visiting? My husband will be traveling to Europe this fall on business! Have fun! Are you planning on squeezing in a vacation after with the business part? Heading to San Francisco. Perfect bag. I’d use it for weekend trips to Disney. It’d be perfect for that! Which is your favorite Disney Park? Planning on going to Lindon next year. This would be the perfect carry on. Our niece is getting married in South Carolina in September. Perfect bag! My Dad’s high school class reunion is in August in Pennsylvania and this would fit my travel luggage needs perfectly. I am taking a lifelong dream trip in January and heading to London! Desperately needing a new carry on! I would take this to Ocean City or wherever I go. Thanks for the chance to win! I will travel to visit my BFF in another state. Cool! What state is your BFF in?